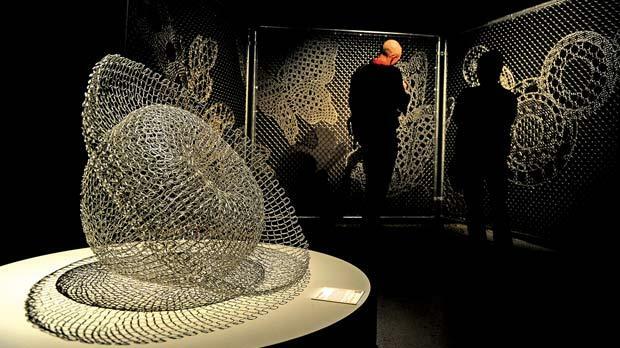 A woman (below) standing near an exhibit at the Love Lace exhibition of contemporary lace works by artists and designers from around the world at the Powerhouse Museum in Sydney. Photo: Greg Wood/AFP. Right: A woman walking past an exhibit at the Love Lace exhibition of contemporary lace works. Love Lace is considered to be a major exhibition of contemporary lace-making practices which is hosted by the Powerhouse Museum in Sydney, Australia. Powerhouse is a internationally renowned museum that focuses on intersections of science and design. Eight individuals are representing Canada in the exhibition – Lenka Suchanek, Catharine M. Thomson, Yvonne Wakabayashi, Noelle Hamyln and Torontonians Lizz Aston, Meghan Price and Anna Lindsay MacDonald. Over 130 artists from 20 countries unleashed their passion for lace in this spectacular exhibition of winning entries and finalists in the Powerhouse Museum International Lace Award, said a spokesman for the organisers. Playful and inventive, the works on display present a provocative challenge to traditional concepts of lace. 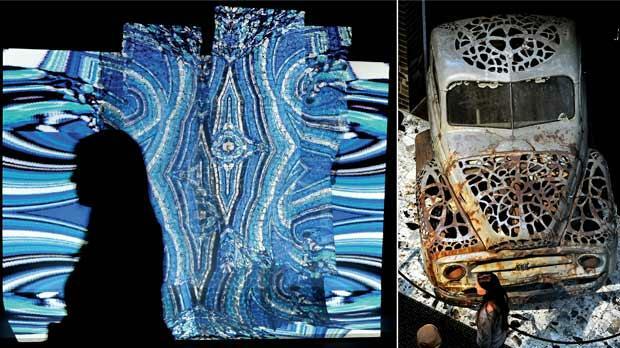 The artists push lace techniques in surprising new directions – knitting human hair into sculptures, crocheting steel wire into a ghostly motor engine, carving lace patterns from the body of a rusty old truck. The spokesman said: “Lace offers the mystery of concealment and the subtle interplay of space, light and shadows. Though lace is usually associated with textiles, curator Lindie Ward broadened the definition of lace to include any “openwork structure whose pattern of spaces is as important as the solid areas”. The exhibition ranges from bold large-scale installations and sculptures to intricate textiles and jewellery. Materials include gold and silver wire, linen and silk as well as mulberry paper, tapa cloth, horse hair, titanium and optical fibre.